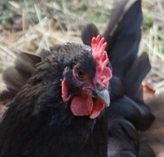 Big Louise, a Black Australorp, ran with the wolves until she was grabbed by a migratory owl. These things happen. Pumpkin, an Americauna, was a curious, affectionate chicken who wanted to be a pet. She was never well, however, and died a mysterious death at a young age. 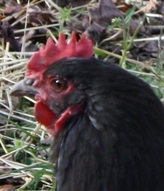 Little Louise, a Black Australorp, was a sweet and beautiful bird who happily laid a medium brown egg almost every day. She died of unknown causes behind the big compost heap, and she will be missed. I wanted chickens for years before I finally got some, and five years later they still make me laugh every day. A big part of the pleasure of keeping chickens is knowing they are safe from the many chicken predators that roam our woods, especially foxes, raccoons, and weasels that can massacre a flock overnight. Roger had kept chickens before, and had seen the carnage that happens when a raccoon finds its way into a chicken coop. Our beautiful new predator-proof chicken chicken coop with attached utility decks and chicken run. 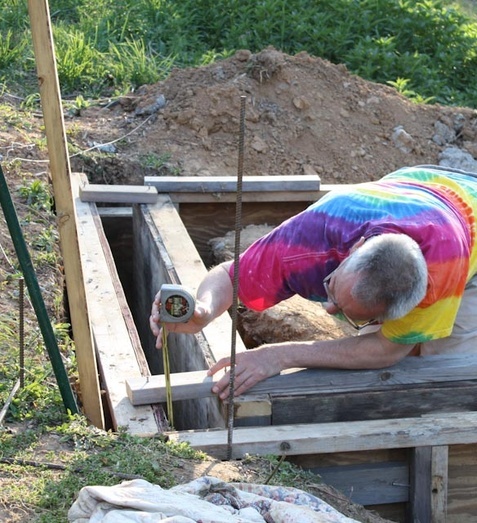 The worst chicken predators dig their way in, so we built our predator-proof chicken coop on a concrete foundation that extends 30 inches below the soil line. On a level site you could use concrete blocks, but we used concrete because of the pressure of the hillside. 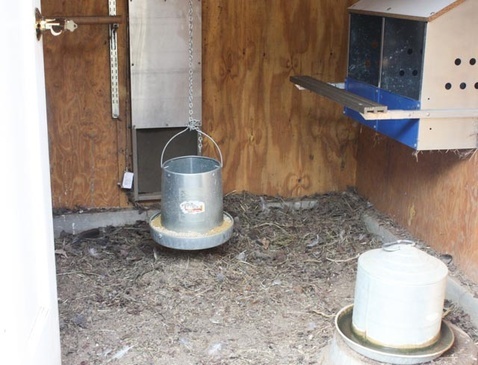 The high chicken house doors that open into the run are kept open spring through fall, but I close them off in winter to keep the coop warmer and exclude mice. Our laying hens free range all day, so the run is not heavily used as an enclosure. We do make the chickens stay in there if a strange dog is visiting, and we keep new pullets in the run for a couple of days of orientation. The sides and ceiling of the chicken run are made of hardware cloth, so it’s a nice protected space for young chickies likely to get plucked up by hawks, owls and other chicken predators that fly. We manage the inside of the coop using the “deep litter” method, which mean I keep the coop floor covered with various types of dry organic matter, with extra material under the roosting bars to catch compostable manure. 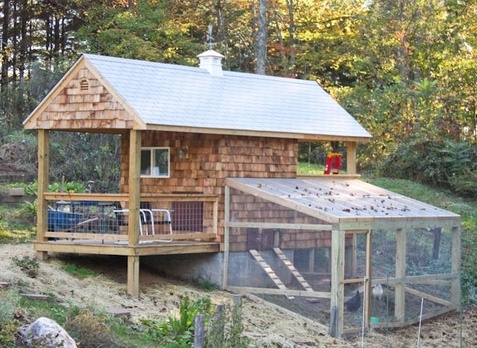 It’s a simple system because the coop is part of the garden. In summer the new litter may be pulled weeds, grass clippings, or safe sawdust, while I use mostly crushed leaves and garden debris in winter. All of this moving of litter is easiest to do with a walk-in chicken coop. With the chicken house door wide open, I can replace forkfuls of manure-enriched organic matter with fresh material in minutes, so the coop never smells nasty to me or the girls. 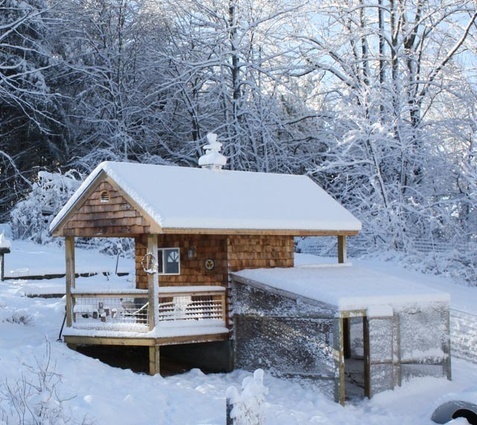 The door should open to the inside so you have access to your coop after deep snows. 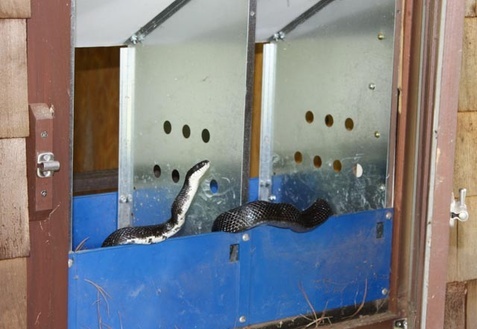 We can access the nesting boxes through an exterior door, which proved to be useful when a big rat snake discovered free eggs one warm summer day. It was my fault – I had been leaving the chicken house door open – and you can’t have a predator-proof chicken coop if you leave the door open. The snake had eaten three eggs so it could hardly move. We nudged it out with the tip of a hoe handle, and never saw it again for the rest of the summer. I was also careful to keep the big chicken house door closed during the day, which made it much harder for the snake to get inside. After four years, the predator-proof chicken coop has blended into the landscape, and I love its safety and dependability. The utility decks attached to the little building are one of the best parts of our design. They provide space for my gardening stuff, and the soil below them stays dry enough to be a dust-bathing heaven for our little flock. We did not choose an easy site for construction, but went with the location that would work best for us. Envisioning twenty years of going out to gather eggs, we opted for the site that provided a level walk from the back door. When you live on a mountainside, a level walk on an icy winter morning can mean the difference between staying upright and falling down. From the start, our goal was to provide secure housing for a core group of five or so laying hens, with space to raise some chicks should we so desire. We live in the middle of the woods, and friends nearby cannot let their chickens range because of coyotes, foxes and other chicken predators, which have taken their hens in broad daylight. Building a predator-proof chicken coop with attached run was a high priority. We started with the 8’x8’ plan from Virginia Tech on Housing for Small Scale Poultry, and added a few features to make the structure and chicken run highly resistant to infiltration by anything bigger than a mouse. We also eliminated the plywood floor in favor of an earth floor we could manage as deep litter. 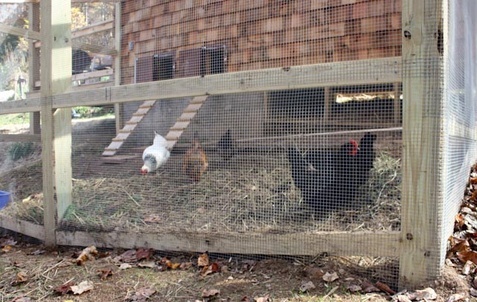 The chicken run is enclosed with hardware cloth that is buried to deter critters that might dig their way in, but it is not as secure as the chicken coop itself. Our good dogs also patrol the perimeter to help insure the safety of the flock. 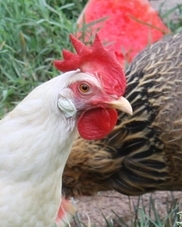 Snowflake, a Light Brahma, serves as flock leader. She rules gently and does a great job. She lays pinkish brown eggs. Gumbo, an Americauna, is the oldest member of the flock, now a full five years old. She is a smart old chicken though she is slowing down a bit. She lays big blue eggs in spring and summer. Bonnie is a white leghorn and she lays more eggs than any chicken I have ever known. She slips through fences and forages where the other chickens won't go, and she hardly ever stays still. 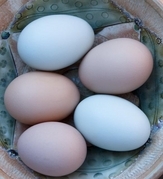 Her eggs are beautiful and white, and she lays even in the winter. Bonnie is special. 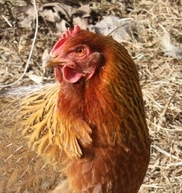 Tammy is a Copper Maran/Welsummer cross, and she is both agile and intelligent. She lays large chocolate brown eggs with darker speckles. 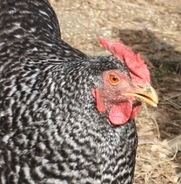 Miss Gray is a Barred Rock/Leghorn cross called a California Gray. I call her a worrywort. She scolds and worries all the time, just like Chicken Little in the childrens story. She knows only one sentence and one tone of voice: The sky is falling! The sky is falling! Good thing she lays elegant pinkish-brown eggs.